I have been working on my collages on oak board over the last month or so. It has been intermittent, with lots of gaps in between. Some of them worked, some of them didn’t. I am not very good at letting things go, (when perhaps I should), so I persevered with these. 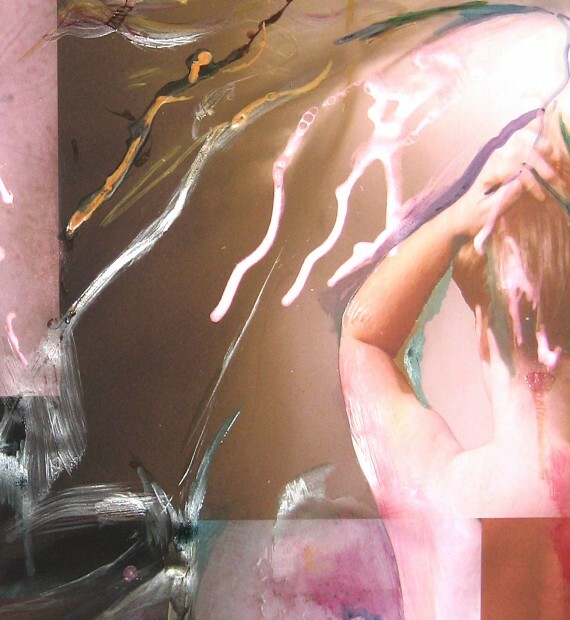 The whole premise behind these works is to explore a little further the crossing of borders between photography, collage, paint and surface. 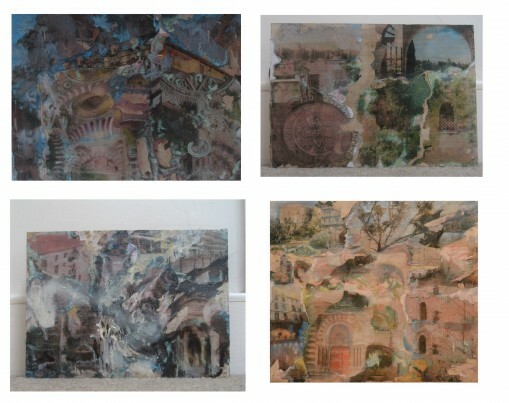 I focused primarily on old cities, deliberately letting the surface of the primed board (rabbit skin glue and marble dust) show through and also letting the rips and tears within the collaged image reveal themselves. Just like the surfaces of a city with it’s rough surfaces, worked over many times, pasted adverts ripped off or covered over with yet another advert or swabs of paint partially obscuring what was. Layer upon layer of history building up over time that you can physically brush with your fingers as you walk around the streets. The element of touch conjoining the person, the buildings, the past and the future. I deviated a little within these explorations as I had so much fun adding texture to the work. I think it’s good to mix things up a little so one of my pieces, rather than use a city, I simply collaged and finger painted onto a thick piece of round cardboard, using images of a UK pebbly beach and a dog. I wanted to convey an idea of a memory, the visceral sense of the rocks, a damp dog and the old boats marooned like beached whales. 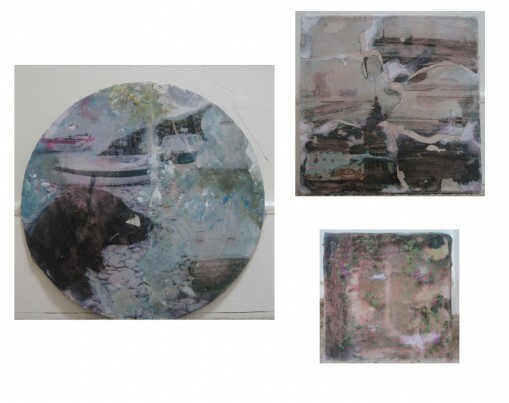 For another 2 pieces I collaged onto small canvases (also primed with rabbit skin glue and marble dust). One was of a scene in Margate – I liked the idea of this connection between the vast expanses of sand and pools of water and the grey grey sky (as it happened to be that day). The other was a very small study of a section of crumbly looking wall with wisps of foliage trailing and creeping all over, as if becoming one with it…and there upon lies the thrust of all these pieces.